Paul Eugene Green opens with a salsa — two steps to the front, two to the back. A little sway in his hips as he moves. The 61-year-old Pittsburgh man has taught dance and fitness to his nearly 20,000 YouTube subscribers for more than a decade. A few times a month, he takes center stage in front of a green screen — he’ll add a few glitzy neon graphics to the background later. Health facts and stories, delivered to your inbox. Sign up for the HealthBeat newsletter. The goal of each video is simple — to make fitness fun and accessible to his impressive internet following. Green was nearly sidelined in 2014 from his YouTube channel, when he began to experience pain and weakness along the left side of his body. He tried to come to terms with the fact that he may have to hang up his dancing shoes for good. “I saw my life slowing down, and I was really not going to be able to enjoy the things that I was passionate about,” he said. 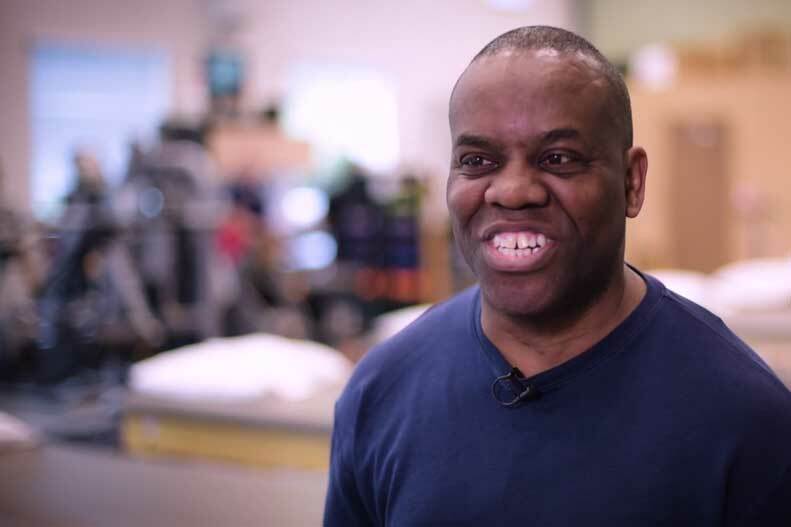 Green sought care from UPMC neurosurgeon Kojo Hamilton, MD, who performed an exam and diagnosed him with degenerative disc disease of the lower spine. The road back to dance turned out to be shorter than Green thought — Dr. Hamilton recommended a comprehensive physical therapy program, specially designed around Green’s love of dance. Back surgery wouldn’t be necessary, Dr. Hamilton said. Dr. Hamilton sent Green to physical therapist Erica Coffey, of UPMC Centers for Rehab Services, at the UPMC Rooney Sports Complex. She was uniquely qualified to get Green back up and dancing — she’s been a physical therapist for the Pittsburgh Ballet Theatre for 16 years. The first line of defense for someone with back pain is typically physical therapy, Coffey said. “The best part about Paul is that he’s really enthusiastic and really motivated, which makes my job a lot easier,” Coffey said. During her evaluation, Coffey determined that Green had lost significant flexibility and core strength. She started his physical therapy (PT) program with exercises on the exam table — and eventually got him up and moving, mimicking his signature dance moves to get him back to the studio faster. His YouTube channel has amassed more than 26 million views from around the world since its inception in 2004 — and Green has even shared his recovery story in a YouTube video on his channel.